My weight this morning was 280. I am down 29 lbs since I went to the hospital on Jan1st 2012. Actually, I weighed 335 when they checked me in, but by the time I got out of ICU I was at 309 because of the fluid that they took off or me. So I don’t count 335 as my starting point, I go with the 309 base weight after. Since my A-Fib has converted and I have much more energy, it is time to start a workout routine. SO today I put together simple routines to get started 3 days a week with the dumbbells I have here at home. I will also be walking the dog daily, planning on at least 20-30 min to get the heart going and burn some calories. I got out and walked her a mile in 30 min today, that is about 150 calories burnt so it is a start. Here is a copy of my chart I made up to keep track of my workout, I did different sections of the body on Mon, Wed, and Fri, and added dates and boxes to mark off when I complete each exercise . Hopefully this keeps me on track to an even healthier me. Tomorrow is my follow up EKG and Blood work to make sure my heart is still beating correctly. I have been feeling better than I have in years so I am sure this will be a good doctor visit. God has been on my side for this journey and continues to help give me the strength to steer my path in the right direction and to continue to improve my health and wellness. Monday I start college again, It has been 7 years since I left my studies and I am ready to get back into the swing of it. I will be finishing a Bachelors in Business Management and Business Technology. Luckily I have enough transfer credits that I will finish these degrees in just 2 years. I am excited to have something new to fill my time and stimulate my brain. Everything continues to look up and improve each and every week, I can’t wait to see what God has for me next! Thursday turned out to be the most amazing day I could have had. After a long sleepless night, I went to the hospital for my scheduled Cardioversion. Frightened and shaking I was directed into a room to get in a gown and hair cap and wait to go to the ICU for the procedure. The nurse came in and put the IV in my arm, she then allowed my hubby and Mrs. Geneva to come in to wait with me. Soon after the man came in to do the EKG to make sure everything was ok to continue. After about 5 min, the nurse came back in and to all of our surprise, and great delight, the EKG showed a regular rhythm. She said the cardiologist would be in to talk to me in a minute. When he came in, I am not sure who had a bigger smile, me or him. He explained that it seems my heart has converted itself out of A-fib. This can happen in some cases, and we just have to keep monitoring it, in case it goes back into A-fib. Of all the scenarios that I had run through in my head, all the possible outcomes I had imagined, this was never one of them. Wednesday evening I made sure to call my grandmother and my mother for comfort, to both them and myself. I prayed to Jehovah for the strength to endure whatever lay ahead. I never ask him for anything unreasonable, or place any ultimatums on him. I know that in life things will happen that are not as we wish them to, so I try to always just simply pray for strength and wisdom. I find it unfair to ask him to “make sure things go alright”, mainly for the reasoning that there is no planning the outcome just strength in traveling the path. As I was getting ready to leave for the appointment on Thursday morning, the phone rang and Mrs. Geneva called to make sure all was going ok and that she would meet us at the hospital and her and her family were praying for me. She also was so happy to tell me that my hubby’s Uncle Sam had called her the night before. This was such a great thing to her because Sam is a teacher and Elder in New York at the Jehovah’s Wittiness Headquarters, for him to take the time to call her and thank her for all she had done for us was very special. We hadn’t talked to Sam in a few weeks so he didn’t know that I was going into the hospital the next day, until Geneva told him. Not even 2 minutes after I hung up from Geneva’s call, Sam called to let us know that he and his wife were praying for me and hoped all would be alright. immediately after that call, the state of Louisiana called to let me know that my medicaid was finally approved and that all my hospital bills, dated back to January 1st, would be covered. It was such a weight off my chest to know that the $24k in bills that have been haunting me were finally taken care of. On the ride to the hospital I thought about how amazing it was that, of all days for Sam to call and introduce himself to Geneva, he called the day before my Cardioversion. At just the right moment he was directed to call me that morning when I needed a little extra strength and love. The power of this simple action brought tears to my eyes. At that moment I was sure that everything was going to be ok, and that I was being surrounded with all the support I would need for anything that lies ahead. Thanks to the outcome of the EKG, and my heart converting on it’s own, I was able to just get dressed and return home. This also gave me the ability to attend the Memorial for the Lord’s Evening Meal at the Kingdom Hall that evening. This was to be my first Memorial, as I have just began to study in the last year. I was rather disappointed when my Cardioversion was scheduled for the same day, but I found the procedure far to important to re-schedule. To my joy and amazement, I was blessed with the ability to attend in the end. I am constantly amazed at the changes in my life since I have opened up to the power and love of god. Such a wonderful, strengthening and amazing series of events that happened. What a great testament to the path I have been traveling. What better solidification of daily strength to continue this fight to eat, and live healthy. if the last 3 months of this journey has been able to result in the my heart accomplishing a conversion on it’s own, what is next? I will be excited to see what the results of my next Echocardiogram are in a couple months, will my heart be stronger? I thank god for the strength, the power and the love that has been injected into my life and continues to empower me every moment! Once again I am sitting around the house, waiting for my appointment for my Cardioversion. I feel like I am stuck in a Groundhog Day scenario. Wasn’t I just here? Waiting for Thursday to come? I keep thinking about the procedure. How will I react to the Propofal? How will I feel afterwards? Will it work? If it works, will it last? The cardiology team said that if we wait too long, there is less chance that they can convert me out of A-fib. I keep thinking back on the end of the year, before I ended up in the hospital. I was sick for months, getting progressively sicker. My A-fib was diagnosed on January 1st, but I was sick a lot longer, so there is no real telling exactly how long I have been in A-fib. What if it has already been too long? What if this doesn’t work? What is next if this doesn’t work? I have found myself just staring at my laptop, not really doing anything productive, just stuck in a zone. I can’t seem to focus on anything. I can’t seem to find anything to successfully distract me and pass the time. So many questions, that have no answers, but to just wait and see what haqppens….please God let Thursday come and be a success. Had a busy day, out and about yesterday. Got lots of laundry done, Mrs. Geneva showed me where the Habitat for Humanity thrift store was, as well as the library. While we were in Covington we stopped at Piccadilly for lunch. The thought was that since this was a place that had a cafeteria style, you pick and choose the pieces of the meal you want, it should good choices of food for me to eat there. Think again. Upon arriving the food smelled great, and the variety was wonderful. I went straight to the vegetable section to see what they had to offer, a lovely colorful array for choices, red potatoes, broccoli, corn, carrots, Lima beans, green beans. I immediately notices that all the vegetable choices were all rather juicy looking pans. Now of course this could be from sauces, or just water and natural condensation from a steaming process, so I had to ask how they were prepared. 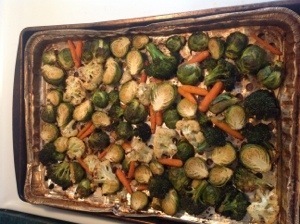 Turns out most of the vegetables were cooked in a bacon base, and the others were cooked in a butter base. None of them were just steamed without any sauces or butters. So I explained to the woman that I am on a very low salt diet and need just plain vegetables with out any seasoning or sauces. She proceeded to shake her head and just plainly say “Well you best just go down to the salad then”. No offer to see if they could possibly steam me some thing, not a shred of interest in accommodating my needs, just a direction away from her section. So I proceeded down to the salads at the end. Now mind you, this is not a salad bar, this is a bin of lettuce and a bin of tomato and they put up a line of little side dish bowls with a touch of lettuce 2 slices of tomato and then sprinkle with shredded cheese and bacon bits. Well again I can not just grab and go with cheese and bacon. So I ask this lady if it would be ok to get a little plate with 2 servings of just the lettuce and tomato, no cheese or bacon. She was nice and did this for me without hassle. I also noticed some little fresh fruit bowls, made sure they weren’t canned fruit in a syrup, and added them to my tray. They had no low sodium options for dressing, and you would have thought I was speaking Japanese when I asked if they just had plain vinegar, so i grabbed a couple lemon wedges from by the tea and called it a meal. I grabbed a root beer at the end of the line, since it was the only non-caffeinated choice other than water. This little lunch cost me $7.50. Lucky for me, I had a container Planters Nut-rition mixed nuts and some Trader Joe’s Plantain Chips in the car. So I topped my lettuce with a handful of those and my squeezed lemon and it made a tasty salad in the end. Now I don’t want this to discourage anyone into thinking that you can’t eat out and enjoy a meal with friends. You can! I had food that was needed to fuel my body for the rest of the afternoon, we had great conversation, we even ran into another member of our kingdom hall and had a nice talk with him as well. All in all it was a nice lunch. The lesson in all of this experience is the importance of asking questions, and not being afraid to find out how things are prepared. I like to think of it in the same way as someone who has allergies, you would not take a chance that something was prepared with an ingredient that could send you into an allergic shock would you? In addition, just as someone with allergies would carry an Epipen, or a diabetic may have to take their Insulin with them when they go out, I like to make sure I have no salt snacks in my purse or car. This way I am never stuck without options of things to eat. To me it is no different, this is a part of my medical process, my food is a key ingredient in my recovery and is as valuable as any of my prescriptions.